A new federally funded cellphone app allows people who may have had one too many to get an idea just how drunk they are – and hail a ride home. 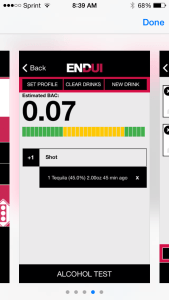 The app, called ENDUI – pronounced “End DUI” – was announced Thursday by government and police officials in Maryland. Funded by federal money reserved for drunken-driving education efforts, the app is among several in a handful of states to tackle drunken driving – though Maryland’s is one of the most elaborate. “It’s unique,” said Kara Macek, a spokeswoman at the Governors Highway Safety Association, of the new app, which was developed by the Maryland Highway Safety Office for about $50,000. The app was funded by the National Highway Traffic Safety Administration. Like the other states, Maryland’s app is available for free on Android and iPhone. One of the games on the app involves pressing a red “brake” button when an image of a pedestrian passes by or a car ahead stops. The app says just how fast – or slow – users react and how much time their car would have needed to avoid a collision. The other game shows nine road signs that blink in different order; users try to recall the order, which gets increasingly challenging with each round – with or without drinks. “Get a cab or have someone that has not been drinking take you home,” the app advises. Gianni called the driving-related features the most important for someone who’s been drinking.